I’m so excited about this brand new product from one of my favorite bloggers, Crystal of MoneySavingMom.com! Over the past few years, I have learned so much about homemaking and budgeting from Crystal’s site. In fact, many of our favorite meals have come from her blog, and I can’t tell you how much we have saved on groceries by following her tips and advice. Now Crystal is launching Grocery University, a program specially designed to teach moms how to get the most bang for their buck at the grocery store. 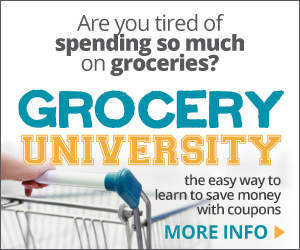 Grocery University is an audio course that you can listen to on your computer, iPod (or other MP3 player). In a little over 2 hours, you can learn what you need to know to keep your grocery budget super low, while still feeding your family well. In addition to the audio files, when you purchase Grocery University, you will also receive a 40-page workbook (PDF) and a valuable price database (which I think is an awesome bonus!). There is no one else who knows more about saving money on groceries than Money Saving Mom! Instead using trial and error to save at the store, you can follow Crystal’s tips to start saving on groceries right away. With my experience in using Crystal’s tips at saving on groceries, I would bet that you would save more than enough on your first shopping trip to cover the cost of the course…and then some!